The product listing ads are a thing of the past. Google shopping campaigns allows you to create more robust and user friendly retail ads that are user centric and also allows you to manage several ad groups together in an easier manner. 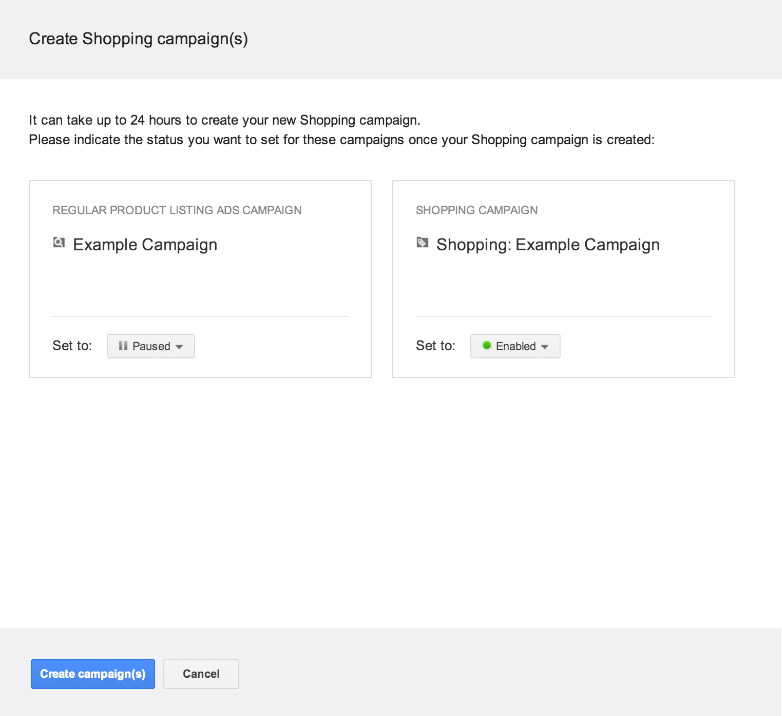 The new shopping campaign upgrade tool will help you to create new shopping campaigns based on the existing product listing campaigns that you have under your Adwords account. If your campaign uses labels or grouping then updating your data feed is the best option available for you as this tool is not compatible for all upgrades. When using this tool, it is recommended that you set your PLA campaign to enabled and shopping campaign to paused. This upgrade will take several hours before your new shopping ads will go live. 1- Click on All online campaigns after signing in to Adwords. 2- The status for campaigns under “Shopping campaign creation status” column will say "Not Submitted". Click the Settings tab and click the campaign you wish to upgrade. 3- Click the Get started button under “Create a Shopping campaign from this campaign" column. This will open up the shopping campaign upgrade tool. 4- Set the status as "Enabled" for your PLA campaign and "Paused" for your shopping campaign. 5- Click create campaign and proceed accordingly.